(Long Island, NY) The Suffolk County Police Homicide Squad is investigating an officer-involved shooting that occurred in Bay Shore on Sunday, March 22. 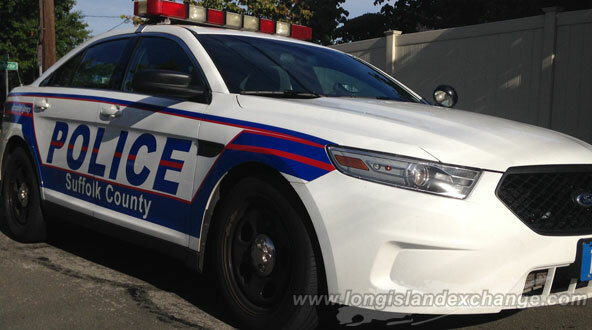 Third Precinct patrol officers responded to a 911 call about a larceny that occurred at Best Buy, located at 1851 West Sunrise Highway, Islip yesterday at 7:46 p.m. When the first officer arrived, a witness indicated to the officer where the suspect, identified as Denzel Brown, was hiding outside the store. As the officer approached, the suspect fled through the parking lot and the officer chased him on foot. The officer deployed a Taser, but it was ineffective. The Suffolk County Police Homicide Squad is investigating a fatal officer-involved shooting of suspect Denzel Brown, 21, of Amityville, that occurred in Bay Shore yesterday. Photo Credit: Chris Boyle. As Brown was running away, he attempted to open the doors of both moving and parked vehicles that were in the parking lot and along Nevada Avenue. He then attempted to steal a running car from a couple while two children, ages 4 and 6, were sitting in the back seat. The couple was screaming at Brown to stop as the officer caught up with him and ordered him out of the vehicle. However, Brown began to drive away and the officer fired one shot at him, opened the car door and attempted to remove Brown from the vehicle. During the struggle, the officer deployed the Taser, which again was not effective. The officer fired another gunshot, at which time, assisting officers arrived and took Brown into custody. Brown, 21, of Amityville, was transported via Bay Shore-Brightwaters Ambulance to Southside Hospital in Bay Shore where he died during surgery. This investigation is continuing. Anyone with information about this incident is asked to call the Homicide Squad at 631-852-6392 or call anonymously to Crime Stoppers at 1-800-220-TIPS.